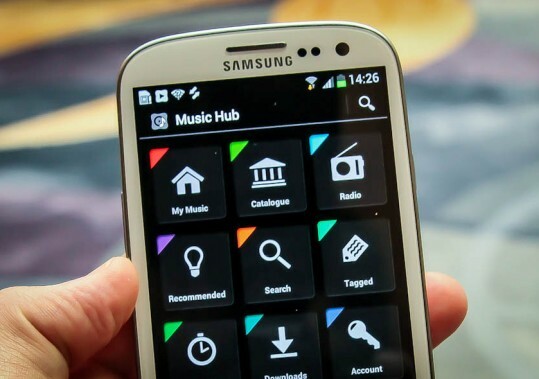 With the roll out of the Galaxy SIII in major markets, Samsung has today announced its new mobile music service which is the Music Hub. It is said to be the first completely integrated, all-in-one mobile music service which will be initially available on the Samsung Galaxy S III in the European markets. The Music Hub is based on the technology services of mSpot and will be offered for free and also in a Premium version. For €/£9.99 per month, you can upload and access your entire music collection anywhere, enjoy unlimited streaming from the millions of songs in the Music Hub catalog and discover new songs with radio stations based on the artists you like. It will also be offering 100GB of cloud storage. Recommendations: Discover great new music all the time with customized recommendations for songs, artists, albums and radio stations. The more you listen, the better recommendations you’ll get. The service will be available to other Samsung smartphones soon, but no confirmed date is announced as of yet. Also we hope the new Music Hub is available to other regions around the globe.